Mumbai: Green crusader, Afroz Shah has hung his boots, albeit temporarily, after being heckled on Versova Beach, during is weekend clean up spree. Few days back, Shah, emotionally tweeted that he is giving up on his clean up mission for the beach. Since then several people including Aditya Thakrey requested him to continue his extra-ordinary work of clean up of the beach, which had started two years back by him, singlehandedly. Later several get connected to this cause. 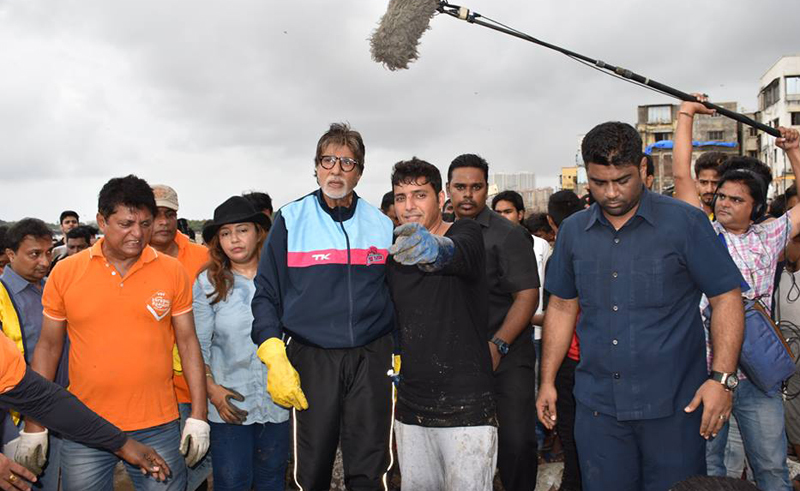 His beach clean up programme had become a movement, in which not only Amitabh Bachchan visit Versova to clean the beach with him, and also called him in the ongoing (Kaun Banega Karorpati) KBC show but UN also recognized his crusade. And it was believed that Maharashtra government will be able to assure the disheartened Shah to restart, but it could not. In his 109-week long movement, Afroz Shah had helped lift 9 million Kilograms of garbage from one of the dirtiest beach of India, Versova. Meanwhile, after the meeting of CM Fadnavis and Afroz Shah, the Twitter handle of Chief Minister Office (CMO), Maharashtra had tweeted that, they will extend full support to the green crusader, and it was retweeted by Fadnavis too. Is it the end of road? On it, he said, “Well, I haven’t dropped the curtains yet. To be honest, the beach clean up was a mission for me. It is very close to my heart. So, if I notice a change, I will be back, and do what I love doing the most.” The green activist, was both distraught and unhappy, with the way the things transpired in the 109-week of his campaign. Especially, after being acknowledged globally and by the United Nation, the decision to call quits was definitely a tough decision for the lawyer-turned-eco-activist. He maintains, though he and his volunteers will no longer tirelessly clean the beach on weekends, he will be keeping himself busy by sensitising the youths about keeping the beach clean and advocating for marine life. Well, Shah, who made it international headlines, single-handedly spearheading a beach clean up programme, does have a point. In most developed countries, beach clean ups are part of community work, where the municipal corporation invites citizens for clean up programmes or asks individuals to donate certain number of working hours for beach development. “We never complained. But when you and your volunteers realise that the civic authorities are not doing their bit, you are bound to get disappointed. What further hurt was the fact that these lethargic officials bounced back to work after my tweet. All the volunteers doing community work, are done now,” he added. However, on social media, specially, on Facebook, the crusader is getting huge support that its not his failure and whatever he has done, he is their hero. Shah, who has been conducting workshops in school and colleges to promote hygiene and cleanliness will continue doing so. In Suhail, India gets its own JK Rowling!